Be the first to enjoy a ride in the only Ferrari Limo in the USA. You have never seen or experienced this before. Get a unique chance to visit the most famous places in the world, Hollywood and Beverly Hills, while riding in the one and only gorgeous Ferrari Limo in America, which holds 6 passengers. The 1h tour will not only show you the top places in Los Angeles, but will give you the feeling of being a celebrity or one of the stars from your favorite movie. You will be riding in a Ferrari 360 Modena built into a 6 passenger Stretch Limousine with an open roof allowing you to enjoy the views of Beverly Hills and Hollywood. Start the tour from the Hollywood Walk of Fame, where you will see the celebrities’ stars and the world’s biggest movie premiere theaters such as Chinese, Kodak and El Capitan theaters. You will not just take pictures of places on this ultra VIP Hollywood tour, you will also get the stars treatment by having tons of people taking pictures of you in that one and only Ferrari Limousine riding down the Sunset Strip! Look at the fancy places and beautiful cars parked on the streets of the Sunset Plaza and continue your journey to Beverly Hills. You will be able to see the stars’ homes and their favorite hang outs along the way. Stop by the Beverly Hills sign to capture the moment of you riding in the gorgeous Ferrari Limousine then enjoy a short walk on the famous Rodeo Drive with its luxurious boutiques and restaurants. 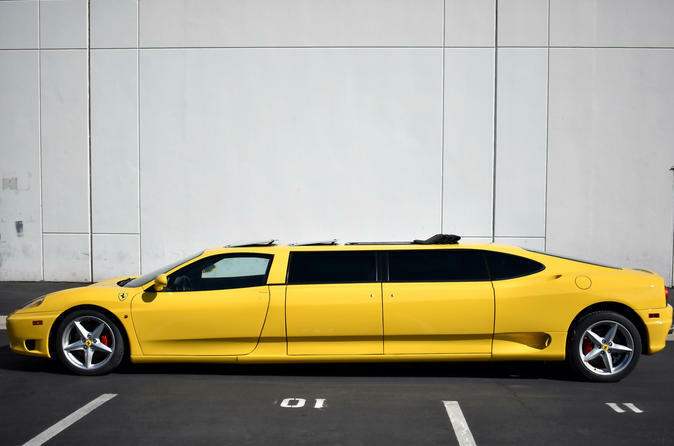 The Ferrari Limo tour accommodates parties of up to 6 people. A professional pilot will guide you and provide you with information about the city, places and history.